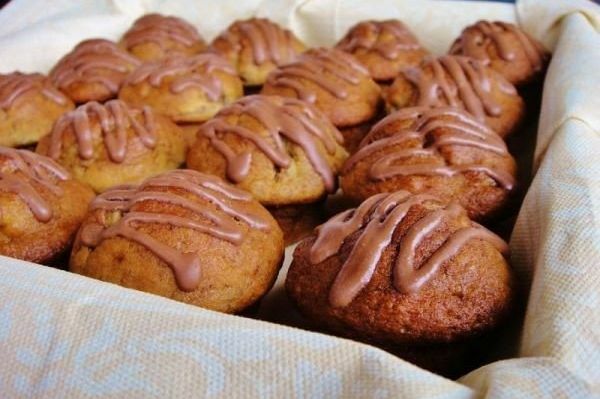 Very quick to prepare and delicious, juicy and flavorful muffins. Win-win dessert for any occasion. Bananas are large and very ripe — 3 PCs. 1. Cleaned the bananas and mash them with a fork in a large bowl. 2. Add sugar, slightly beaten egg and melted butter. Mix thoroughly. 3. In a separate bowl mix the remaining dry ingredients: flour, yeast, baking soda and salt. 4. Combine with banana mixture. Should be batter. 5. Molds for baking grease with butter and sprinkle with flour. Include preheat the oven to 190 degrees. 6. Fill molds test and put to be baked for 20-25 minutes. 7. During this time, the muffins will rise very much and browned. Removing them from the oven and slightly cool. 8. Removing them from the molds. 9. And leave to cool on a towel. 10. The finished muffins optionally decorate with frosting. 11. Served with tea or coffee.